I know that living in Finland differs quite a lot from the rest of the world. We have cold and dark half of the year, lots of open space for 5.2 M people. We have saunas and we swim among ice. We are also quite liberated in things which in some countries are considered forbidden subjects. So usually I am not surprised when I watch TV and see programs where even the lips are censored when someone says a dirty word or when I hear music where part of the words are missing. It's a pickup line using calculus. Try to solve the equation & you will come up with a rude pickup line. Though to the 99% of the people who will see this, it wont make any sense as what is the result of evaluation of this math expression, & apart from this a further 0.4% (plus or minus a bit) are more likely to jump on the erroneous conclusion that the integral evaluates to 42 without trying to plug in the values. If this still doesn't make sense, it may be helpful to note that the numeric result of the calculation is, in the idiomatic slang of most of the population of the United States, suggestive of a particular interpersonal activity which does not fall under the heading of things permitted in public. The answer is 69! Does this revelation make me an adult-content blogger? Should I check the textbooks for problems and censor all of those with this answer? I teach adults but how many of them know about this being so suggestive? We pick up slang very easily nowadays! Labels to this article were humour and offbeat. At first I thought that it was just humorous but after thinking about this for a while I started to think the sadness of the story. 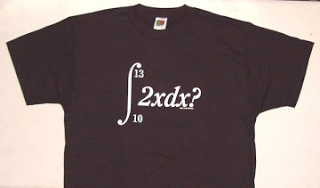 Besides, a beautiful mathematical expression and even a beautiful answer... How can that be a RUDE pickup line. I have heard much ruder! Can you change the link URL in your post (http://conceptisaddict.blogspot.com/2007/09/humour-of-hypocrisy_22.html) from http://algebraoflife.blogspot.com/2007/09/t-shirt-with-attitude-so-whats-all-this.html to Crooked Brains’s new one http://www.crookedbrains.net/2007/09/t-shirt-with-attitude-so-whats-all-this.html.